Uterine fibroids are benign, or non-cancerous, muscle cell growths that form on the uterine wall. Symptoms of uterine fibroids include tenderness, swelling, heavy menstrual bleeding, and spotting between periods. In severe cases of uterine fibroids, surgery, such as a hysterectomy, may be the only option. Treating fibroids through diet and exercise is a way to prevent severe cases. Soy has been found to help shrink uterine fibroids, as they contain isoflavones and phytoestrogens, according to "The Encyclopedia of Natural Healing," which help to regulate estrogen levels in the body. High estrogen levels feed growing fibroids, while soy evens out estrogen production, eliminating fibroid feeding levels. Select natural soy foods when grocery shopping. 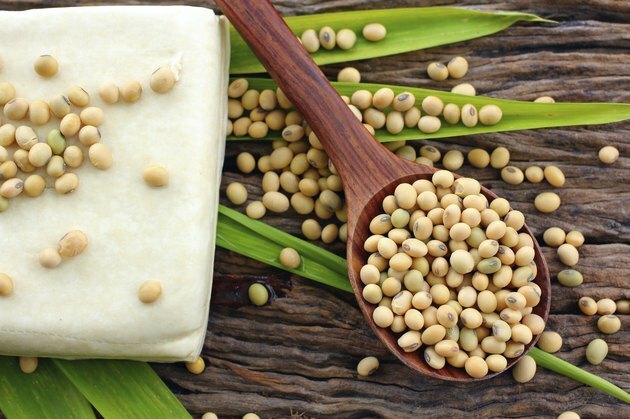 Soy that is not genetically modified is ideal for fibroid dieting , delivering 80 mg of much-needed isoflavones daily, according to Marcy Holmes, NP, Certified Menopause Clinician. Ideal foods include tofu, soybeans, and legumes. Opt for soy milk in lieu of whole or lowfat milks. Soy milk is all natural and does not contain genetic altering additives. These milks come in a variety of flavors such as vanilla, chocolate, and regular. Season cooked dishes with soy sauce to add flavor and soy nutrients to your meals. Soy sauce is mainly associated with Asian dishes, but you can add its flavor to any dish. Pure soy sauce is sold in local supermarkets and organic food stores. Eat plenty of high-fiber foods in conjunction with soy products to keep constipation away. Constipation aggravates fibroid symptoms and can worsen pain and pressure. Ensuring a balanced diet of soy and fiber foods, such as whole grains, green leafy vegetables, and nuts will optimize fibroid shrinkage, providing much-needed symptom relief. Avoid taking soy supplements, as these are chemically altered sources of soy. According to Dr. Andrew Weil, M.D., there is lack of evidence that soy supplements aid in shrinking uterine fibroids. Dr. Weil: Women's Health &amp; Soy?